At its heart, this is the same bike that’s won four Paris-Roubaix titles. This article is part of RoadBikeReview’s $3,000 Endurance Bike Shootout. See an introduction to the test here and head over to our Shootout Round-Up Page to read the rest of the reviews. But the bike business is a what have you done for me lately game. So how does this budget-friendly version of the bike Tom Boonen races actually stack up to the competition? 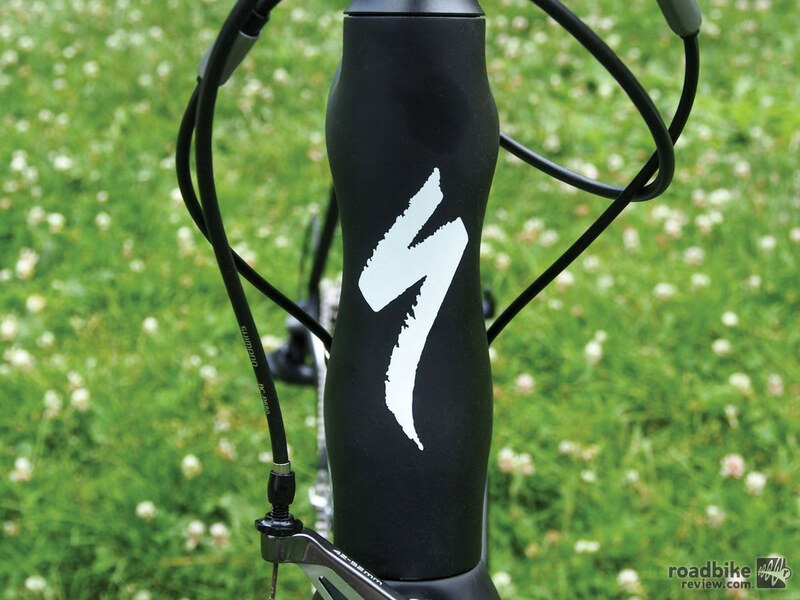 Indeed, Specialized has long been a champion of the right weapon for the right battle mantra. And the Roubaix has never been positioned as a threat for the Polka Dot jersey. Our size 56cm 2014 Model Year test rig tipped the scales at 18.32 pounds without pedals, which was nearly 2 pounds heavier than the lightest bike in this test, a 58cm Scott Solace 20, which came in at 16.49 pounds. Cost certainly plays some role here. Nearly a pound of that weight differential was in the wheels, which was also reflected in the price tag. At $3400, the Solace 20 is $450 more than the Roubaix SL4. It’s worth noting here that Specialized is already pushing out its 2015 Model Year bikes, which includes a slightly revised version of this bike. Dubbed the Roubaix SL 4 Comp for 2015, the bike will run $3000 and come stock with Shimano 105 brakes and a Praxis Works BB30 compact crankset. You can see full spec of that bike here. Here’s a breakdown of prices and weights for all the bikes in this test. The 2014 Roubaix SL4 also loses points for its broken groupset. Instead of carrying a full 11-speed Shimano Ultegra drivetrain, a compact 50-34 FSA Gossamer crankset and Axis 2.0 brakes are swapped in. Some testers perceived subtle flex and chain rub in the crankset, and there was consensus that the Axis brakes were a step below the Shimano Ultegra stoppers found on several other test bikes. However, the Axis 2.0 brakes did provide a significant amount of tire clearance. 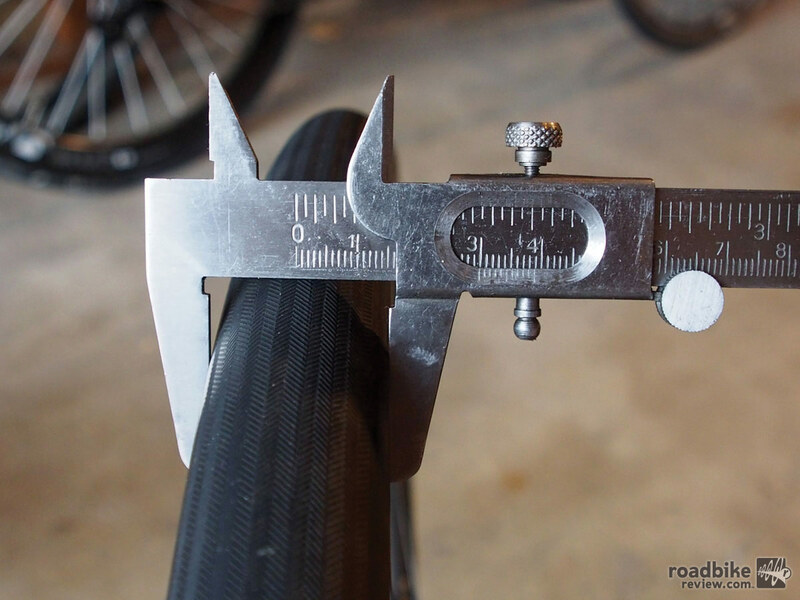 The 2014 Specialized Roubaix SL4 easily passed our wide tire test (see photos below), and it’s clear we could have gone wider. 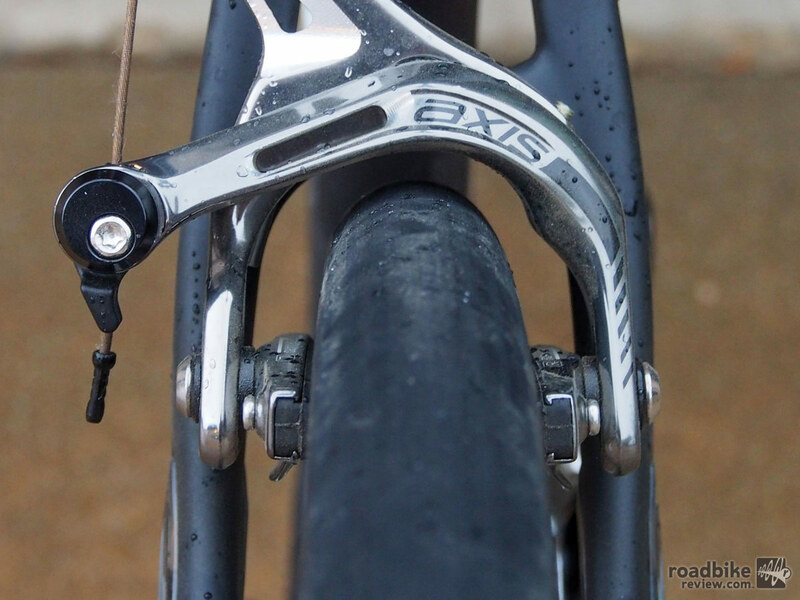 We’d prefer to see Shimano brakes, but the Axis 2.0’s had no trouble with our wide tire test. We also noticed a potential issue with the seat post clamp bolt, which is located at the top of the post. Because the bike comes stock with a Specialized Romin Body Geometry Gel with center cutout, it wasn’t hard to access that bolt. 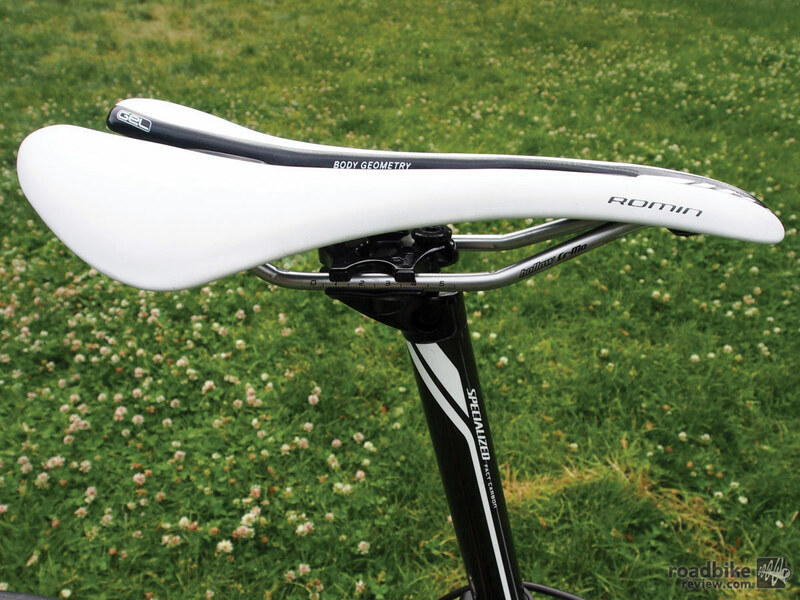 But if you swapped on a saddle without a cut-out, things would get a little tricky. If this seems troublesome, but you’re committed to Specialized, consider upgrading to the $3300 Model Year 2015 Roubaix SL4 Comp Disc or the $3500 Roubaix SL4 Expert, which comes with Ultegra rim brakes and a carbon FSA compact crankset. The eye-catching feature on all the Roubaix bikes is undoubtedly the Zertz inserts, which are integrated into the seatstays and fork legs. Specialized calls the hard rubber-like material a visoelastic damper, and claims that as vibrations travel from the road through the wheels and up through the frame and fork, the dampers at the mid-section of each seatstay and fork leg help dissipate the shock before it reaches the rider’s hands and body. It’s difficult to know exactly how much effect the inserts actually have, but the bike certainly has the kind of smooth ride you’d expect in this category. A narrow 27.2mm seatpost also helps. 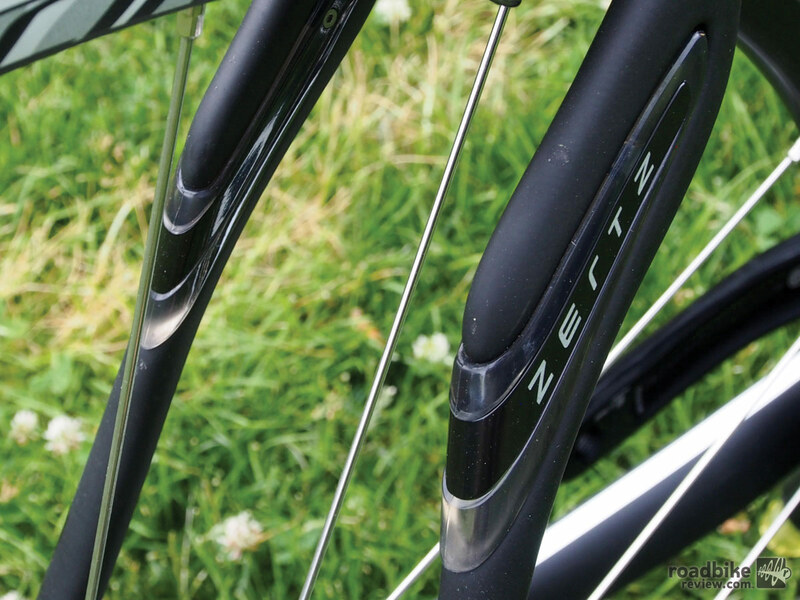 Zertz inserts in the seatstays and fork legs help damped road buzz. Same goes for the stock 27.2mm seatpost. At the same time, the Roubaix SL4 drew high marks for stiffness, thanks in part to its FACT carbon frame that capably handled the hardest out-of-saddle efforts we could muster without noticeable slop. Just a quick glance and you cant help but notice the beefy chainstays, bulbous downtube, and wide bottom bracket area. Specialized also deserves props for pushing the size-specific frame engineering ethos. The idea is that tube diameters, layup schedules and seatstay angles need to change as you go up in size in order to assure that riders of all frame sizes experience the same ride quality. It’s a novel approach to frame design and one we’re fans of. Here’s a breakdown of key geometry measures, using a size 56cm frame as the baseline for comparison. Specialized has also tried to up the bike’s climbing chops by spec’ing a long cage Shimano Ultegra rear derailleur and 11-32 cassette, which when combined with a 34t small chainring, yields a gear most riders will easily be able to spin up the steeps. We also like the tire spec on our test rig, a pair of 26c Specialized S-Works Turbos (MSRP $65, claimed weight 440 grams). But the company’s on-line spec sheet says the bike comes with 25c Specialized Espoir Elite tires (MSRP $35, 540 grams), so you might not be so lucky. 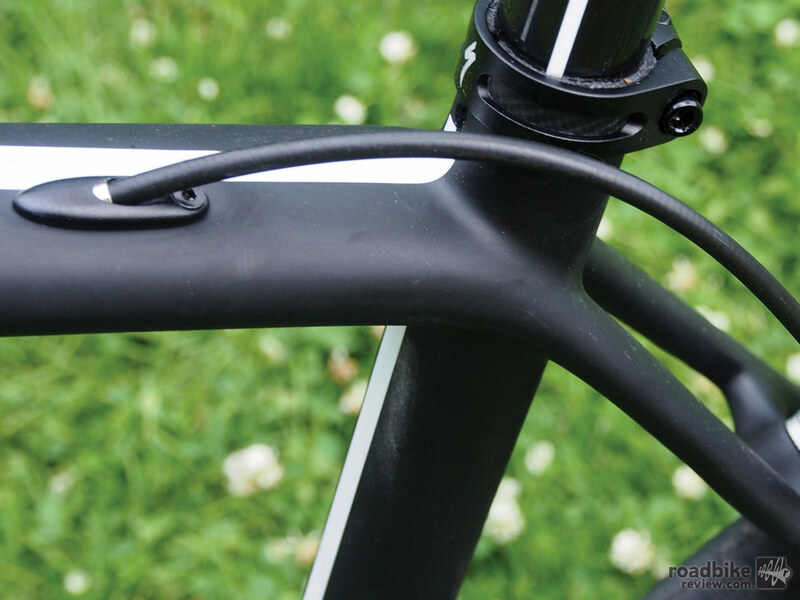 Cable routing is fully internal — and Di2 compatible. The unique head tube shape is claimed to create a more direct connection to the front wheel through the steer tube, while maintaining compliance. 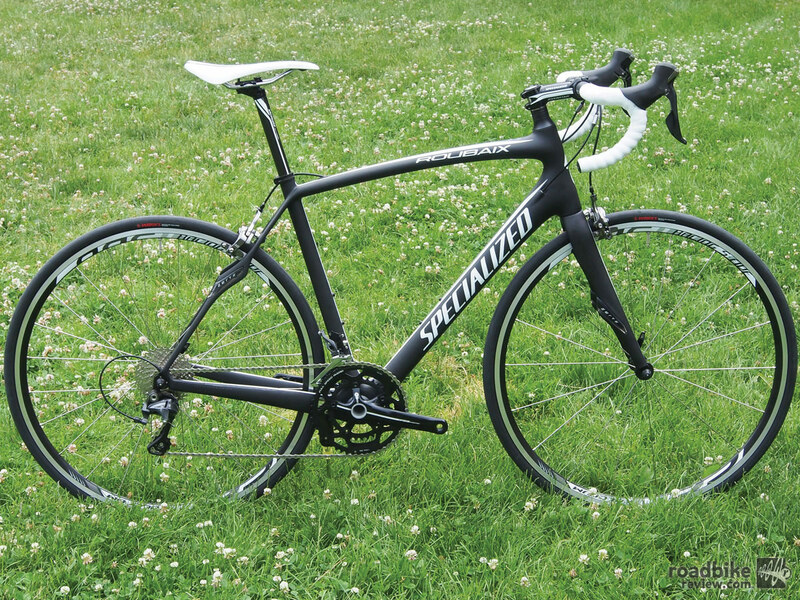 As the least expensive bike in this test, the 2014 Specialized Roubaix SL4 is a solid value that’s ripe for upgrading down the road. It does a great job soaking up road buzz and delivers a comfortable all-day ride. We also loved the wider brakes for the extra tire width capacity, but wish they worked as well as the Shimano Ultegra models found in other bikes in this test. Same goes for the FSA crankset, which felt like a downgrade on an otherwise great looking bike. And while climbing was sluggish, this bike tracks like a missile whether ripping along the flats or carving downhill through high mountain switchbacks.